This was the last episode of Sugar ‘n Spice and we were all in pretty good spirits. We were also way ahead of schedule so that just added to the festive cheer! 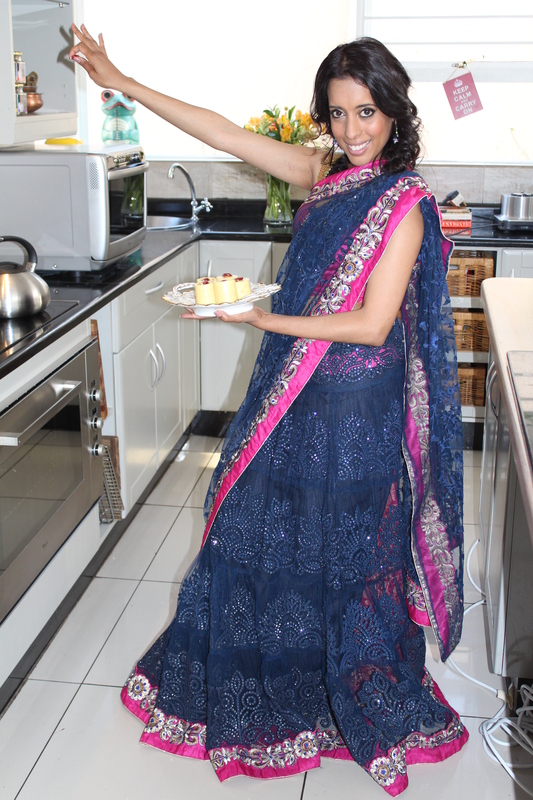 I did have time to pose for the camera…my special superwoman pose always gets everyone giggling! This burfee is made with fresh cream – it needs to be refrigerated until you are ready to serve. If the mixture is still too soft…pop the burfee into the freezer before you un-mould them. It’s a basic recipe that you can play around with…my favourite variations are pistachio or coconut instead of almonds. 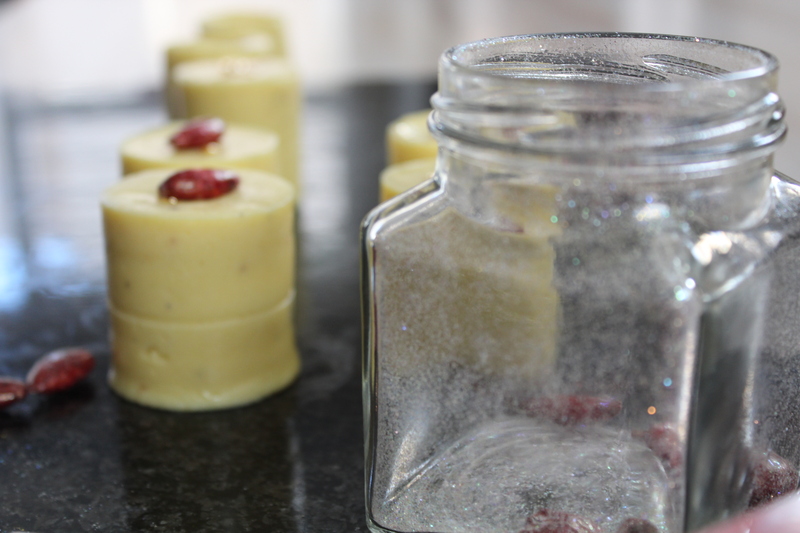 Yudhika’s Handy tips…use a consol glass jar to tint the almonds! Another handy tip – place the almonds in a glass jar and add the food colouring. Close the lid and shake the jar, adding a little more food colouring to get the perfect shade…tip the almonds onto a baking tray and roast until they are dried. Using the jar prevents you from ruining that perfect manicure! Spray a silicone mould with non stick spray. Place the milk powder and dessert cream in a mixing bowl. Use your fingertips to rub the cream into the milk powder. Leave aside for an hour. Place the milk powder in a Kenwood food processor. Process the mixture until it is fine in texture. Place the condensed milk, fresh cream, butter and sugar in a thick bottomed pot. Heat the mixture on medium and bring to the boil. Stir constantly until it has reached a custard like consistency. Add the milk powder into the hot cream and mix well. Add the sifted icing sugar, ground cardamom and ground almonds. Mix well to evenly distribute the almonds and ground cardamom. Spoon the mixture into the silicone mould and gently compress the mixture. Leave to cool and then refrigerate until set. Turn the mould over onto a baking sheet and gently push the burfee out. Decorate with edible gold leaf. Top each piece with a whole tinted almond. The burfee must be chilled when it is being un-moulded. Pop the silicone mould with the burfee in the freezer for 10 minutes if it is too soft.